The situation was this: I had to put together a 500 point army to participate in the local Games Workshop store's Warhammer 40,000 league, which would run throughout November and December of 1999. Some additional restrictions applied to the league armies: only one HQ unit could be used, costing no more than 100 points; only one each of Fast Attack, Heavy Support and Elites; at least one Troops unit; only one piece of weaponry/wargear chosen from the Armoury. This all clearly demanded an army built around the basic trooper, an army that would perform well because the guys in ranks did good, not because some tooled-up character slaughtered a dozen enemies in one round of combat. As I see it, there is only one choice when you have to rely solely on the abilities of the troopers: Space Marines. I never go to war without a reason and a theme. A quick glance over the league background produced by the store gave only a few cursory details of why we would all be bashing each others' heads in for the next two months. The scrap was taking place on an Imperial world where forces from practically every race had journeyed, in search of... something. Even with so little to go on, the shape of an army was forming in my mind. It would have to be mobile, able to go anywhere quickly, but not so large as to attract attention. As the battles we would fight were to be Cleanse missions, the force would have to be able to spread out and hold ground, dealing out damage to the enemy as it went to prevent them doing the same. I could not afford to sit back and shoot, the battle would have to be taken to the enemy - that way, if the enemy wanted to occupy table quarters, they would have to fight their way through me to do it. For what it's worth, I added some background of my own. The 'prize' up for grabs was the wreck of a Dark Age colony ship, holding the promise of lost technology. The Furies had sent the strike cruiser Fiorentina to deploy a force led by the second-in-command of the Third Company, Lieutenant Alana Devereaux, a specialist in covert ops and rapid strike warfare. Their mission was to secure the wreck, and prevent Imperial or hostile forces from entering. My original intention had been to base the army solely on troops, meeting the minimum requirements for having a leader at all. Devereaux was chosen as a Leader-level hero, with the same statline as a Veteran Sergeant, and armed with a power weapon. The power weapon was, I felt, a necessity - with the army moving out towards their opponents, close combat was inevitable, and the popularity of marines ensured I would be facing plenty of them. If I could take away the enemy's armour, without allowing my own troops to fall victim to the same ploy, that would go a long way to giving me the upper hand when two armies met. After several games I decided to upgrade Devereaux to a Commander-level hero, the equivalent of a chapter captain. I thought this would be appropriate for a Lieutenant, but I had also found that the power weapon was such an asset that it needed to be wielded to maximum effect. The extra Weapon Skill was useful, as I would now be hitting enemy marines on a 3+ in assault, and the increase in Initiative meant I would do so before they could strike back. The additional wound meant that Devereaux could take on tougher opponents and survive, while the extra attack just made her all the more deadly. Although I didn't discard the notion that troopers were the basis for the army, it was clear that a strong leader could make all the difference when two equally-powerful forces met. Every marine army should have a Tactical squad. The versatility of this squad amazed me throughout the league games, as they were required to take and hold quarters, pitch into raging assaults, and stand back and gun down their enemies. I settled on a squad of six, after beginning the league with seven (the extra marine was dropped to yield the points for Devereaux's upgrade). With the single Armoury choise already used there may have seemed little need to upgrade Sergeant Tyrel to a Veteran, but I found the extra attack useful in assault, and his Leadership kept the squad stable under pressure. The selection of a flamer as the squad's assault weapon was a matter of no choice - I haven't yet got around to buying plasma rifles or meltaguns. But the flamer proved itself worthwhile against all opponents - firing on marines it hit enough targets that the armour saves were too many to pass, and against lesser-armoured targets it was absolutely deadly. I didn't give this squad a heavy weapon as I wanted it to move a lot - its role was to follow Devereaux around and keep her from being outnumbered, so it wouldn't be standing still. As we were allowed to make minor changes to our armies during the league, I occasionally included a missile launcher with this squad, when I knew I would need the firepower, but overall I preferred to keep the Tacticals on the move. Even a mobile army needs fire support, so I chose a 'mini-Devastator' squad to fulfil this role. I saw little need for a full complement of heavy weapons, and the costs of such weapons in Devastator squads are high. Instead I used two missile launchers, so that their ability to switch from frag to krak would make up for lack of multimeltas and plasma cannon. This squad proved itself able to handle tough targets time and again, smashing its way through Predators, Dreadnoughts and heavily-armoured infantry throughout the league. A small bonus was that people tend to underestimate the missile launcher's anti-tank ability - being so used to facing lascannon, they can be a little too relaxed against a krak missile. Considering the amount of damage it did, this squad suffered remarkably little hostile fire during the games. I found the Scouts to be the real heroes of many a game, which surprised me as I had not used them extensively before. But in such small games of 500 points, the Scouts are excellent value for money. Their ability to move reliably quickly through difficult terrain allows them to close to pistol range without taking excessive hostile fire, and a bolt pistol is no less powerful that a full-size bolter. Though they have weaker armour than full marines, their high toughness compensates, and with the high Leadership of a Veteran Sergeant they rarely fall back even when they do take casualties. In close combat they are brilliant - armed with a pistol and close combat weapon they are, apart from their armour, the equivalent of dedicated Assault Marines. This came as a shock to many opponents. Including the extra attack of the Veteran Sergeant, this squad could put out 16 Attacks when charging - enough to damage most enemy squads beyond repair, even if the Scouts take casualties in return. I often made sure to assault with the Scouts at the same time, and same target, as Devereaux and Tactical Squad Tyrel. The combination was overwhelmingly powerful, and generally put the enemy so far on the back foot that he could not recover the game. The final element in the army, and always worth the points paid for them. The Bikers often moved ahead of the rest of my army, drawing fire, which, with their high toughness and 3+ armour, they can afford to do for a turn. This allowed the Tactical and Scout squads to advance unmolested. The Bikers also were put to good use charging into any enemy squads that I wanted to take out - even if they did not kill the enemy themselves, they proved durable enough to hold up their target until the other squads arrived to charge and finish them. Depending on the nature of the enemy force, the Bikers could excel to 'trouble-shooting' duty. Such targets as Terminator-armoured Chaplains, Armoured Fist squads and fast-moving Assault Squads pose a real danger to the rest of my army, and I was often saved some difficult work by the Bikers coming face-to-face with such targets and gunning them down. The meltagun proved itself invaluable, both against vehicles and characters - in both cases the speed of the Bikers was a great asset, allowing them to target the weak rear armour of vehicles, or close to within 6" to prevent characters being screened by nearby squads. The flamer was also of great use, for the same reason - the Biker armed with the flamer was able to move to exactly where he wanted to be, to get the best possible shot against the target. In one game, the Bikers' flamer hit ten models in one shot, effectively disabling two squads in a single shooting phase. Force Fiorentina performed excellently as a whole, finishing the league with a Win-Draw-Loss record of 4-3-1. Although I could cite any number of moments of individual heroism - Devereaux single-handedly annihilating a Wolf Lord who was, in terms of stats and rules, exactly her equal; Scout Sergeant Harker fighting off Dire Avengers for three whole turns after the loss of his squad; the Devis surviving and breaking an attack by Assault Marines - it was as a coherent army that Force Fiorentina made a name for itself. Each squad performed its duty admirably, but never without a thought to how their actions would affect the whole battle. The Devastators took care to eliminate targets that could threaten the advancing squads; the Bikers were always the first to stall enemy charges; the Scouts and Tacticals assaulted simultaneously many times, often from different directions, breaking their enemies by weight of numbers as well as superior skill. 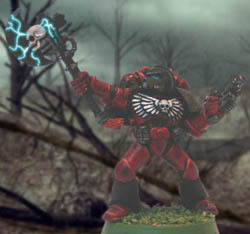 And Devereaux was always in the middle of it, causing impressive amounts of damage - apart from the aforementioned Wolf Lord, she also accounted for a Wolves' squad, a Dark Angels Master, an entire squad of Imperial Guard, an Ultramarine Tactical squad, several Chaos Terminators, and countless other miscellaneous enemies. Based on this, I am already planning a few additions to the Furies Third Company. More Scouts is the obvious choice, a larger assault-oriented squad, and perhaps a bolter squad with a missile launcher and sniper rifles. A couple more Bikers would allow me to field two squadrons of three, with various special-purpose weapons. And, even though I have twenty already, more basic Tactical marines with bolters will never go astray.